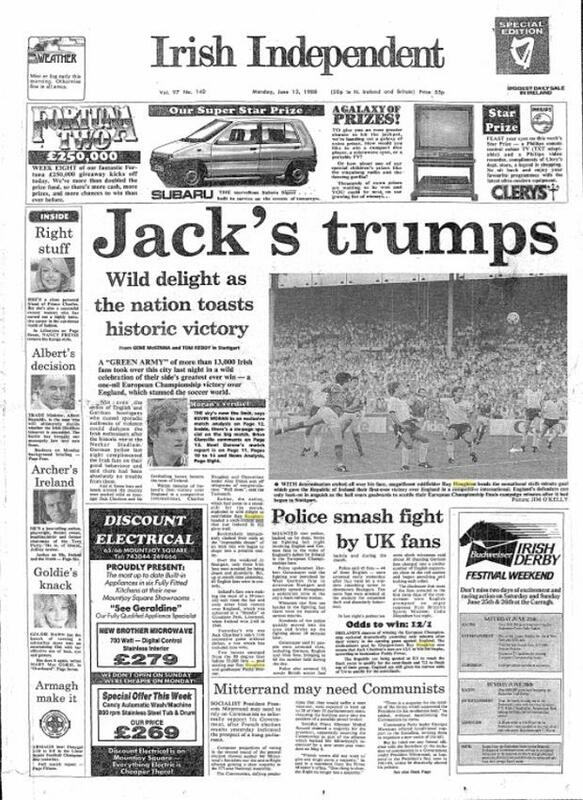 Ireland’s fate in their first-ever game in a major finals sealed before a ball was kicked? 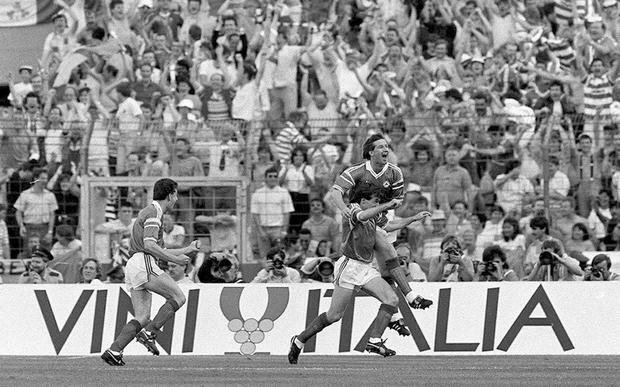 Ray Houghton has gone down in history as the man who scored that goal in Stuttgart, 30 years ago today. No matter what else he achieved, and he did of course score another goal of note, against Italy in 1994, the tiny Glasgow-born Irishman has something which will probably be etched onto his gravestone. “Who put the ball in the England net? I did, I did,” as Houghton was heard to sing on the team bus when the Irish squad came home from Euro 88. But despite the pressure of being first-time participants on the big stage, the heat of a West German summer and the edge of playing an England side seen as far superior, it was a relaxed Irish camp. “When we qualified, as players we didn’t know what to expect as Ireland had never been to a major tournament before. We got ourselves off to Germany and it all began,” recalls Houghton, who also went on to play in two World Cups (1990 and 1994). The European Championships had already started in earnest before Ireland played the English on a Sunday in Stuttgart. Spain beat Denmark 3-2 in the opening game of a tournament that seems quaintly tiny by today’s standards – only seven teams coming through the qualifiers to join hosts West Germany. Also in the early stages there was a 1-1 draw between Italy and West Germany, with a young lad called Roberto Mancini scoring for the Italians. 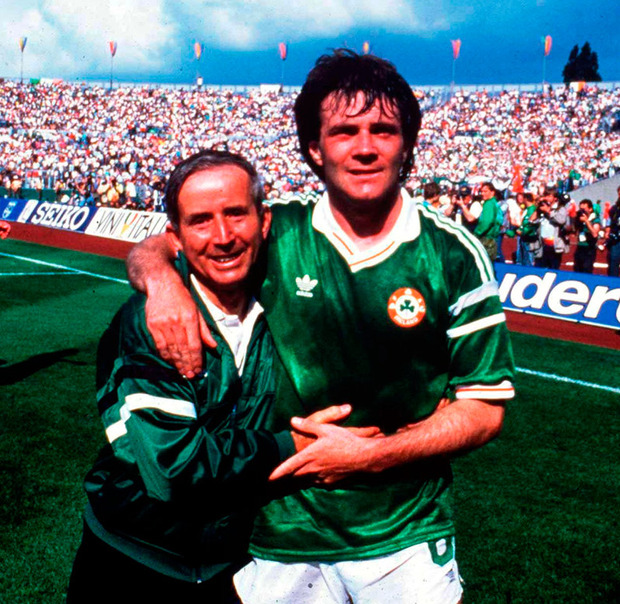 “I reckon he will be one of the stars of the tournament,” said Liam Brady, on TV duty at Euro 88 as he was out with an injury. On the day of the England clash, the talk in the Irish camp, and back home, was of injury. Chalrton had dropped Kevin Sheedy in favour of Tony Galvin, even though both men had their fitness problems. Galvin had barely featured for his club, Sheffield Wednesday, in the weeks before the finals. Ties were strong across the two squads due to knowledge from the club scene in England, so there were no secret weapons in either camp. Believe it or not, there were three players from Derby County between the two camps (Peter Shilton, Mark Wright and Frank Stapleton). There was a dash of continental glamour (Glenn Hoddle and Mark Hately attached to Monaco, Gary Lineker at Barcelona, John ‘Budgie’ Byrne at Le Havre) and six players from Liverpool (Steve McMahon, John Barnes, Peter Beardsley, Ronnie Whelan, Ray Houghton, John Aldridge). “On the day of the England game, it was an early kick-off and a very warm day. We all knew the England players as we’d played against them for our clubs,” says Houghton. “It couldn’t have gone much better for us. I scored six minutes in – I was fortunate to be the one to score the only goal of the game. We were lucky in the second half as England had so many chances but we defended really well, we got men behind the ball, Packie Bonner was in outstanding form. The Irish camp had little time to take in the magnitude of the win, gearing up for a trip to Hanover, 500km to the north of Stuttgart, for the second game. “We were in such good form after the England win but we knew the next game, against the USSR, would be so tough,” Houghton recalls. Next stop, and the last stop, would be the Parkstadion in Gelsenkirchen, for the final group game. A name never heard before in Ireland, Wim Kieft, would become a name to dread. “We hit the post early on and whatever Holland threw at us, we were able to deal with it. But then Ronald Koeman had a shot, Wim Kieft got a head to it, it looked like it was four or five yards wide but it took a peculiar bounce and it spinned past Packie,” Houghton says. The 1988 Boys in Green... where are they now?